The money in your pocket is changing. 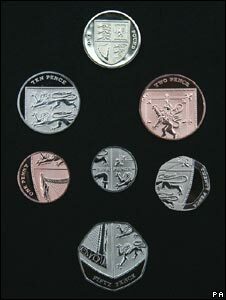 The backs of the one, two, five, 10, 20, and 50 pence pieces and the pound coins have been redesigned. The main change in the design of competition winner Matthew Dent is that the coins all feature different parts of a single image, the Royal Shield of the UK. The size, shape, material and weight of the coins remains the same, but there are subtle and significant differences in the designs. The reverse design of the £2 coin is completely unaffected. Philip Mussell, of Coin News magazine, and Philip Nathan, sculptor and numismatic designer, responsible for numerous commemorative British coins and the general coinage of Barbados, among others, give their observations on the new designs. The theme of a single image shown in parts over the reverses of the coins surprised many. "They are quite different from anything we have ever had before," says Mussell. "Every single image has been a complete image as far as I'm aware. It is a very clever, innovative way of doing things." The old coins all showed a single image. The portcullis on the one penny piece, the crowned lion on the 10 pence or the Tudor rose on the 20 pence piece are all very recognisable images. These will now disappear from the nation's coinage. The innovative design concept of the coins can have a strange effect when the coins are taken in isolation, as can be seen with the new 20 pence piece. Because of the way the shield is divided a fleur-de-lys appears pointing diagonally downwards at the top of the coin, notes Nathan. "The twenty pence piece is a very difficult shape to work with. In this case the designer has ignored it." But the 20 pence piece also shows the similarity with the old reverse. The practice of having the lettering mostly indented, rather than raised as in other coins in the series, is retained. Also retained is the thick band at the edge of the coin. In the old designs, the image runs over on to the band. In the new design the banding is also used for the image. Nathan was quick to spot that the other major difference is the absence of numerals. In a nation visited by so many non-English speakers, this is an interesting choice, suggests Mussell. On the old coins there were numerals on the one, two, five, 10, 20 and 50 pence pieces, but not on the pound coin for obvious reasons. Ahead of the unveiling, the major news was the absence of Britannia from the the 50 pence piece. But, Mussell points out, this motif is not a constant of British coinage. It was introduced by the Romans, fell out of favour after their departure, and was reintroduced by Charles II in 1672 with the goddess modelled on a female friend of the king, says Mussell. The move away from Britannia has not pleased traditionalists, with the Daily Express labelling a move to drop an "iconic figure" as "plain daft". But some will have noted that many 50 pence pieces already do not feature Britannia, instead devoting the reverse to major commemorations. These have included D-Day and entry into the European Economic Community. The new coinage offers no nod towards the national symbols of Wales, notes Mussell. The quarters of the shield represent England, Scotland, Ireland, and England again. On the old coins, the two pence piece showed the emblem of the prince of Wales, three ostrich feathers within a crown. The new design shows the Scottish section of the Royal Shield. For all the radical redesign of the reverse, the new coins are remaining the same in many ways. Their size, shape, weight and metal make-up will not be affected, something that is very important for quick recognition by shoppers, Mussell says. The new pound coin is being referred to as the "jigsaw box lid", as it bears the complete image of the Royal Shield that is spread across the other coins. The old coins had a polished finish, while the new have some matte elements. The new coins do not have the raised dotted line just inside the edge of the piece that could be found on all the old circular coins. "Beading is not that traditional [on British coinage]," says Mussell. "I wouldn't say it went back more than a couple of hundred years." Philip Mussell believes the new designs are intriguing, with the main theme, the spread image, a first in coinage. But Philip Nathan does not believe that the new designs represent a satisfying artistic and numismatic whole. The selection of designs by committee often makes achieving this difficult, he insists. "There is no special interest in terms of history," he says. "All we have done is subdivide a single coat of arms. Changing it this way does not make the images look modern. It is a graphic design solution." There is also a hint of an important decision in the coin re-design, Mussell says. The inclusion of new one and two pence piece designs suggests they will continue to be a part of the coinage system for some time to come. Predictions of their demise may prove tobe premature. I agree that it may not be a good idea to remove numerals from the coinage. Not only would they benefit foreign visitors, but they are more likely to help those with poorer vision. For instance, suffers of diabetes may have both poor vision and an impaired sense of touch in their fingertips, so it would not be enough to simply say that they can "feel" the different coins. It should be remembered that coinage must be used by all sectors of society. These are designers' coins, in the same way as dresses are designers' dresses - and my wife would not dream of wearing those. If nothing else, a loss of Britannia is to be decried. As a simple usability problem, the coins do not feature a numerical inscription of their value. This affects people with poor reading skills, those with bad eyesight, non-English speakers and from a day-to-day perspective makes it harder to scan the coins. This is also a problem of their generic appearance as none of the coins (except for the £1 coin) have strong individual elements. A nice concept, but put into practice it's an incredibly poor design. Great idea. Fresh, modern and unique without losing the visual look and feel of the coins. Plus the coins are more representative of the four beautiful countries that use them as currency. These look much better than I had expected. Granted, in isolation the coins lack the individual iconography associated with the late 20th Century coins, however there are many new opportunities available with this approach. Firstly, it is good that people moving to Britain from other countries will learn the words 'Ten Pence', rather than just looking at the numbers. The coins now necessitate an introduction to the English language. Secondly, special editions can easily be produced along the same lines - for example, an Olympics 2012 version, with the £1 coin again acting as the jigsaw box lid and a commemorative design being spread across the other coins. Regional versions, including Wales, could be produced in the same way, as could jigsaw puzzles of Britannia and other icons. I can see many, many opportunities for striking and relevant imagery here, and I can imagine children being excited about getting the first "piece" of a new set, and wanting to find ot her pieces in their change in order to construct the new image. The quarters of the shield represent England, Scotland, Ireland, and England again. And I believed Wales to be part of the British Isles - Perhaps I'm wrong. Ironically a Welshman designed this coinage and they were produced at the Welsh Mint - I'm surprised they got accepted. I think they look good: Modern, innovative and yet still instantly recognisable. My only point of complaint would be that now that we have a family/set of coins where is this going to leave the £2 coin? It's now the complete odd-one-out. The idea for one image over several stamps is an old one. Putting it over several coins does not work as you are unlikely see them together and separately they look a mess. While I have no problem with the new designs, given what little can be bought for one and two pence I am rather surprised that the Treasury/Mint are persisting with their production. I have been speculating for some years now that it is only a matter of time before the "coppers" are phased out entirely as happened to the old half-penny and sixpence which was revalued at 21/2p. Presumably it is a cheaper and more eco-friendly solution to melt down existing coinage to make the new designs rather than simply collect and dispose of the millions of 1p and 2p pieces in circulation? An opportunity missed. What we need is a new, smaller, set of lighter coins that reflect the depreciation that inflation has wrought, going up to £5 or even £10.